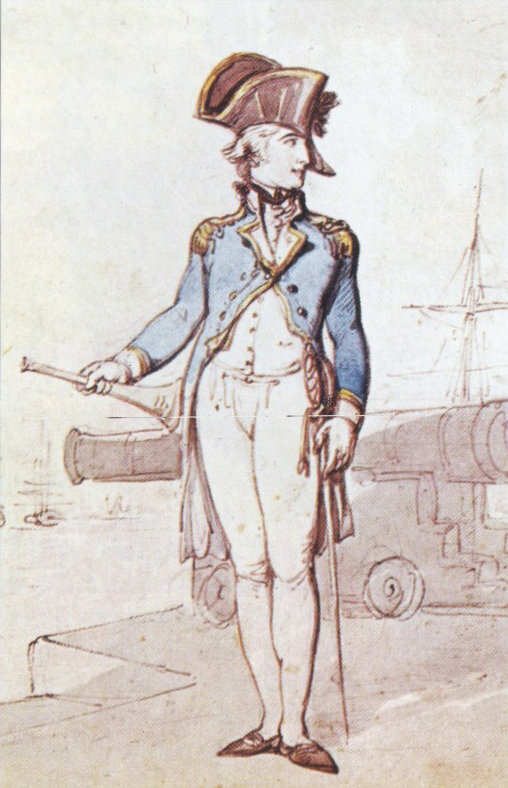 There weren’t many in the Georgian navy who made the hard journey from before the mast to officer on the quarterdeck – just a few hundred in the whole of the period of the French wars, Tom Kydd included! In nearly all cases these were hard men from humble backgrounds who had no truck with fancy manners and fine clothes like those who entered the officer class the easy way – as midshipmen with family wealth behind them. Tarpaulin officers were known as such because in foul weather like the seamen they wore gear made of tarpaulin, canvas waterproofed with tar. It was very practical attire in grievous cold and wet but well-bred officers looked on the practice with disdain as the clothing smelled pretty tarry and the reek of the tarpaulin officer lingered on in the ward room. The second question was asked by Jeff Souder. ‘Is there a maritime origin for the phrase “lower the boom”? Today, in colloquial speech, lowering the boom means abruptly stopping someone from doing something. A good case can be made for salty derivation. A boom is a long spar, used for example, to extend the foot of a particular sail. When a ship makes port, the boom is lowered (to take the strain off the standing rigging). The ship has stopped, her voyage is over. Another explanation I once came across is that in the days of pirates an annoying crew member could be got rid of by making sure he was standing near the boom, then loosening the lines. The boom would swing, crash into the unsuspecting victim – and knock him overboard. Do send in your questions for Ask BigJules! This is the last post that I have received from Big Jules? Not sure if gremlins have got in the system, and dropped me off the mailing list, or if you have gone AWOL doing a bit of research for your books. If I am off the list can I please be added back on, as I enjoy the knowledge and humour of your posts. I work in the Disability Sector, and after a particularly trying day, all I have to do is read your post and it either gives me a chuckle or is a nice wind down. Either way it puts a spring back in my step. Thanks for the attention to detail and passion that your books are full of, you have given me many many hours of joy reading them. Wishing you and your Family a Happy and Healthy Christmas and New Year. Hi John – there have been about a dozen posts since that one, they’re all on the site so you haven’t missed out on any… Sorry you haven’t received them, perhaps you have a new spam filter? Suggest you re-register to be sure to get future ones. The box to register is on the front page of the site. I think there is a Dutch derivation. Boom means ‘tree’ in Dutch and the expression lowering the boom therefore means denying entrance, be it to a track (with a tree perhaps), fenced premises or indeed a harbour. The “No tarpaulin he!” reminds me of the brilliant Robin Hall/Jummy MeGregor ballad-opera “Bengbow was his name” broadcast on BBC TV in the mid-60s. As a tarpaulin officer Benbow was despised by the “cowardly captains” of his squadron – one of whom wold have liked seamen to have been schooled so well in dancing that a lady “might be obleeged to dance with them”. These captains deserted Benbow when the enemy hove into sight but he went on alone, in Rawalpindi/Jervis Bay style, to take them on regardless. Benbow lost his leg by chain shot and died thereafter but the leaders of the cowardly captains were deservedly hanged afterwards. I seem to remember that some of the evidence against them was provided by the commander of the French squadron, but memory may play tricks on me in this. As to the origins of the word ‘tarpaulin’ as regards the clothing of lower deck hands, and in reference to some officers attaining rank by way of the lower deck .. Americans, especially ought to realize that the term “tar” speaks of STOCKHOM TAR, rather than the asphaltum we commonly envision in the states. Stockhom tar was the amber piney resin of trees, not the black tar of petroleum oil. Given the preference, I much, MUCH prefer the more pleasant oder of Stockholm tar than that of crude tar asphaltum out of the ground. Re. Lower the Boom question. I have heard a couple of other explanations. One is the lowering of a boom to close a harbour entrance. The other was the lowering of a derrek boom in a port. Both still with a naval connection.